New initiative seeks to run Shas, Agudat Yisrael and Degel Hatorah together on the same ballot. The three haredi parties in the Knesset – Shas, Agudat Yisrael, and Degel Hatorah – have been holding contacts in recent days on running together in the April elections. According to a report on Wednesday in Hadashot TV, the initiative is being led by a group of rabbis seeking to determine that in the elections there will be one ballot at the polling stations that will include Shas and United Torah Judaism, with its two parts: Agudat Yisrael and Degel Hatorah. The initiative became serious after it received the blessing of Rabbi Chaim Kanievsky, the spiritual leader of Degel Hatorah. Prime Minister Binyamin Netanyahu is ready to mediate between the sides in an attempt to secure a stable right-wing bloc, the report said. Earlier reports indicated that the two factions making up United Torah Judaism could be headed for a breakup. 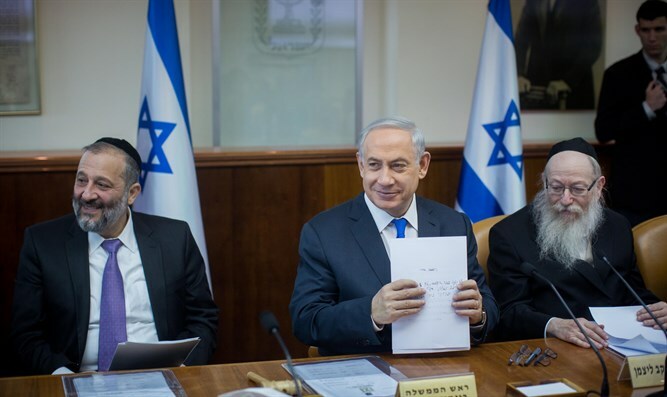 In the wake of the Zionist Union’s sudden split between its member parties – Labor and Hatnua – members of Degel Hatorah faction said the haredi party is weighing a similar breakup.